Regardless of our wishes, winter is coming. Before you know it, the days will be short and cold, and snow will be a regular part of our lives. Have you decided whether or not you will be hiring a snow removal company to handle all of your commercial or residential snow plowing, deicing, and snow management, or whether you will be doing it yourself? In today’s post, we are going to help you explore the pros and cons of DIY snow removal vs. hiring a snow removal company. Don’t have time to read? Ready to schedule your professional snow and ice management service? That works, too. Give us a call at 330-299-4404 or fill out this online form, and we’ll secure your spot in our regular snow removal schedule. Do you have a truck, plow, and equipment? Although it could probably go without saying, we’ll say it just in case. Having a truck, mount, and plow is essential to clearing snow, especially if you have a commercial lot or long residential driveway. If you don’t have these basic necessities, it’s probably best to leave the task for someone more equipped. Also, do you have a backup plan if any of your equipment fails? Do you have the equipment and know-how to distribute de-icing products? Plowing and pushing snow away is just one aspect of snow management. More dangerous than snow is what is often underneath. We are, of course, talking about ice. Having a system for distributing de-icing materials is vital to minimizing safety risks. Are you able to clear snow and ice in the early morning? Winter weather is reliably unpredictable. If you are the owner of a business or commercial property, are you able to get up early in the morning and remove all the snow and ice? Going at it alone means that you have to monitor the weather and set aside enough time to perform preventative maintenance and snow removal and deicing following a big storm. Do you keep documentation each time you plow and remove snow and ice? If you are the owner of a business or commercial property, it is crucial to be properly insured in case there’s an accident on your premises. In addition to this, it is also important to properly document each time you plow and de-ice since this could be extremely useful if you ever face a lawsuit originating from your snowy or icy property. This documentation comes standard when you work with professional snow removal companies. As you can see, this is a decision that should not be taken lightly. 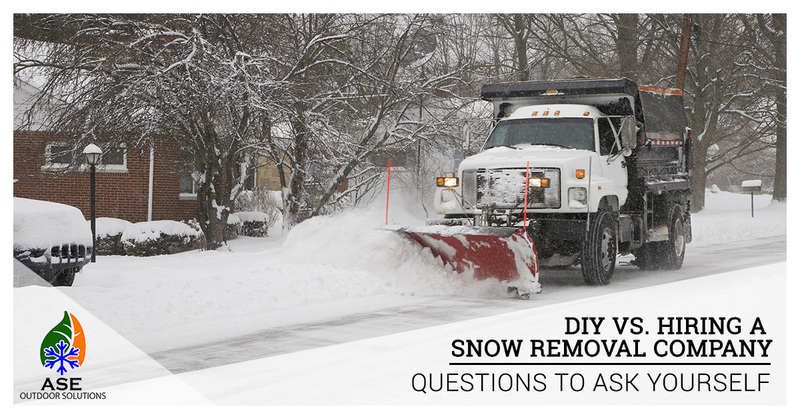 While these are not the only questions that you should consider when trying to decide whether to handle your own snow removal services, these questions should help you get a better idea. If you are in our service area — Akron, Barberton, Medina, Rittman, Stow, Cuyahoga Fall, and other surrounding areas — contact us today to learn more about our snow removal services. From basic residential snow removal to regular commercial snow management, we have the equipment and expertise to handle it all.